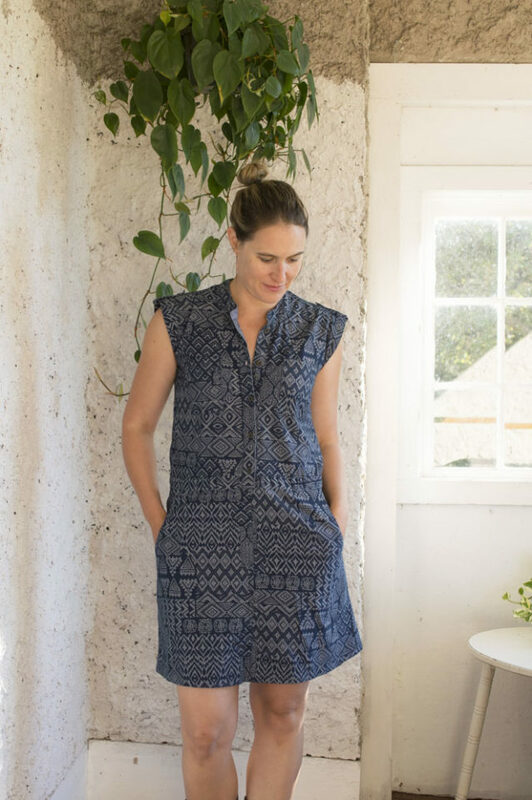 Remember way back last summer when I attempted a Sanibel Dress from Hey June and wasn’t happy with the result? The exact term I used was ‘meh’. It wasn’t the pattern, it was the fabric, and the result just wasn’t an awesome dress on me. I really chose the wrong fabric (stiff cotton) and it was too voluminous around the elastic waistband. Well, I got so much good advice from everyone on how to adapt it. At the time, however, I was feeling a little burned by the experience so I had to let the dress sit for a while. After a few months, empowered by the faith of my fellow sewists, I realized I wasn’t ready to give up on it and revisited the dress. 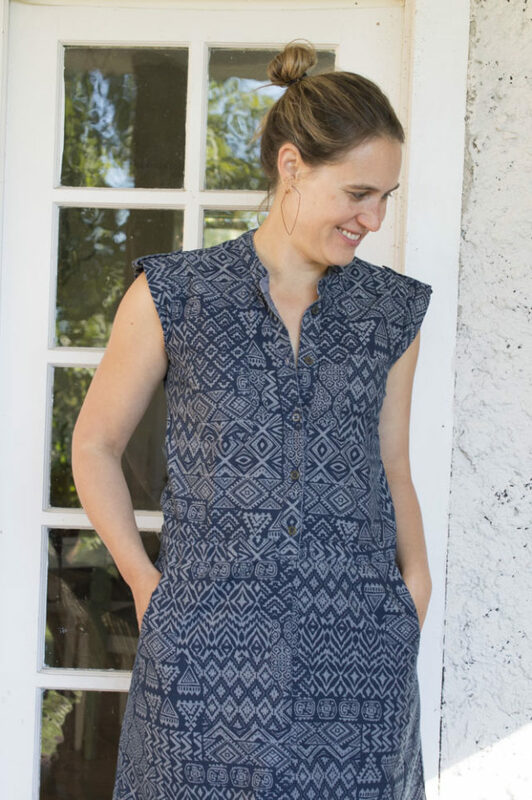 I ended up taking on a Sanibel dress pattern hack that transformed ‘meh’ into one of my favorite dresses. I started by removing the elastic from the waistband. I was a little worried because the elastic casing is actually on the outside of the dress but thankfully this fabric print is scattered enough that you can’t really see the casing. Then, because the dress is designed to cinch at the waist and I wanted to adapt it to a more structured style I had to remove some of the extra torso fabric. To accomplish this, I undertook some totally insane tailoring. I pinned the amount of fabric I wanted to remove from the middle back of the dress and stitched a huge, crazy dart that went from the hem upward, coming to an apex at the middle back, basically between my shoulder blades. Once again, I’m super thankful for this busy, non-directional print because you CANNOT see the stitch. I totally realize that you are probably hoping to see the back of the dress. That would be so logical, wouldn’t it? I’m embarrassed to admit I forgot to take a picture. Complete rookie mistake. So, you do have to trust me. I really love that I was able to rescue this dress and turn it into something I love wearing. 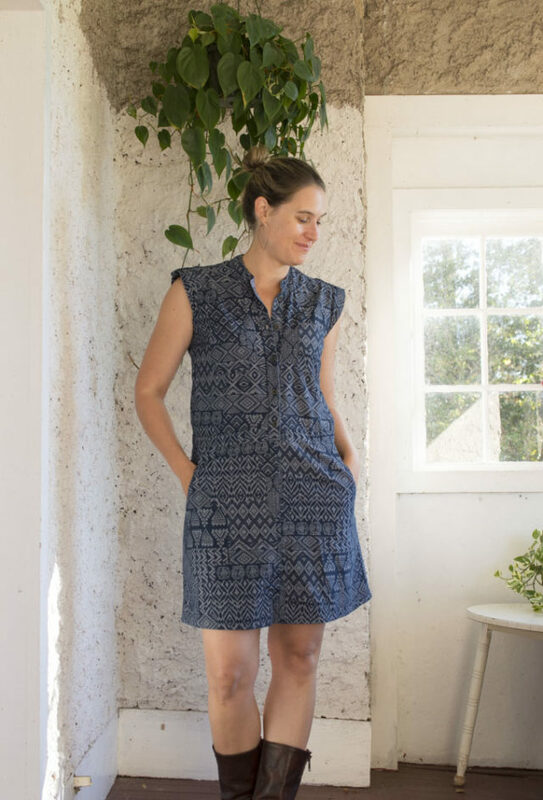 This lovely sanibel dress pattern hack fits my style and it fits my lifestyle. So much of the magic inherent in sewing becomes apparent in a process like this one. It’s one thing when something you bought cheap at a store doesn’t fit. You don’t really have to think hard about why it doesn’t fit or how you could make it fit better (except the desctructive messaging that often tries to tell us it would look better if we were thinner. Blah!). But, when you have invested hours in creating the perfect dress placket and sleeves only to have something look ‘meh’. That’s a different story. It’s a whole reckoning. It is about finding out what looks good on your own individual body and separating it from all other expectations to salvage your hard work. It’s in direct contrast to the way the fashion world operates. They dictate a style; we are all expected to squeeze ourselves into the pre-determined mold and if that doesn’t work the answer is to keep on shopping. It’s part of why I love sewing but particularly pattern hacking…it opens up a world of endless possibilities. I love feeling that I can embrace my body that way. Huge thanks to my sister, Erika, for taking these pictures and for being an all-around awesome person! 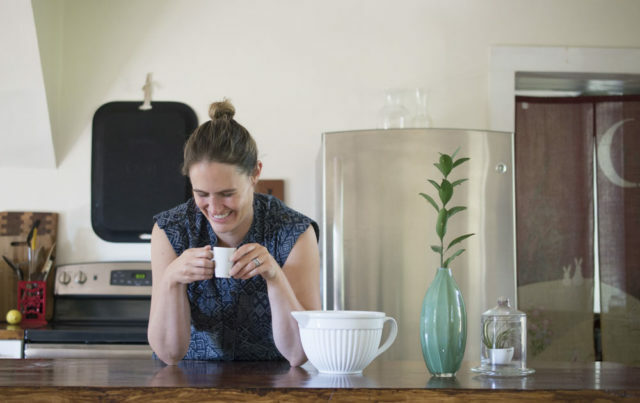 Note: This post contain affiliate links for Hey June Handmade. When you buy a pattern from her, through my links, you are supporting both me and an indie pattern designer. Thanks so much! This is really cute! I’ve been debating buying this pattern, but I think you’ve persuaded me. Great job! Oh what a wonderful save!!!!!! Thank you! I am really happy with how it worked out…hate to have so many sewing hours not end in a wearable garment.